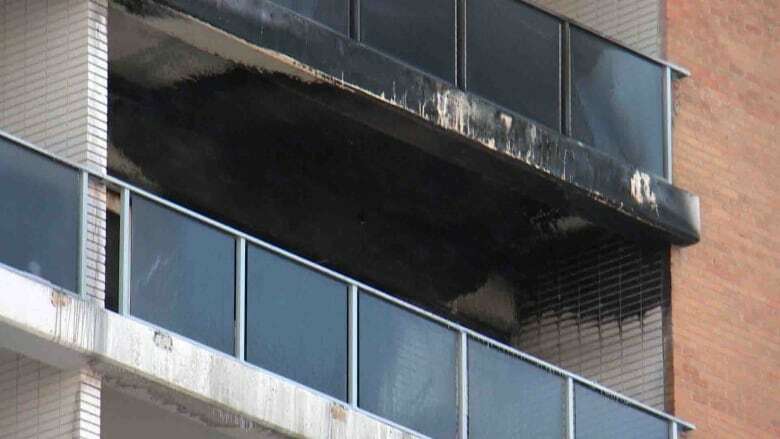 A highrise Winnipeg apartment building was evacuated and three people were sent to hospital when flames engulfed a ninth-floor suite on Monday. District fire chief Mike Siemens said one of the people sent to hospital was the building’s caretaker, who discovered the fire and forced open the door to get two residents out. When the door opened, the caretaker inhaled a rush of smoke, Siemens said. All three people are in stable condition, he said. Multiple emergency calls were made from people in the area of the Taylor Towers at the corner of Taylor Avenue and Poseidon Bay, and crews raced to the scene just after 7 a.m., Siemens said. When they arrived, firefighters saw flames jumping out the ninth-floor balcony and called for more crews and equipment. The entire building was evacuated, with some tenants driving off in their own vehicles and others being sheltered from the cold in transit buses. Concrete floors and walls in the building made it easier for crews to keep the fire contained to the single suite and it was declared under control shortly after 7:30 a.m., Siemens said. The cause of the fire is under investigation but they believe it started inside the suite and extended to the balcony, he said. The suite was extensively damaged by fire, smoke and water, while several other suites also experienced water and smoke damage. Most residents have been allowed to return to their suites but those on the ninth floor will have to wait a little longer for the water to be mopped up and the area to be ventilated because of smoke, Siemens said. The people who live in the suite where the fire started will not be back for some time, though, as that one needs renovation work.